Roses are old-fashioned favorites that often remind gardeners of their mothers or grandmothers or of lush gardens in the South, where both water and sun were readily available from nature. But I see fewer roses in gardens now, partly because they’re associated with lots of patience and care, and partly because some of the hybrid roses need more water than a low-water garden can – and should – provide. It’s also strange to picture a tall, hybrid tea rose in the middle of a xeric landscape, although a good landscape designer can always work a small rose garden into your plan if that’s what you desire. Friends brought us this floribunda as a housewarming gift and it fits nicely in our xeric rose garden. We watered it the first year, but only a little this spring. Species roses. A species rose is basically a wild rose. Several species roses have grown to adapt to drought and other extreme conditions. I have several in my rose garden area, and I know one of them is a Wood’s rose (Rosa Woodsii). It can grow to at least 10 feet and has beautiful pink flowers, followed by hips all fall and winter, which the birds love. Another is a shorter, shrub-style rose that I believe is the Prairie rose (Rosa blanda), with pink flowers that fade to white in the center. The other has deep red flowers. Both have in common large, plentiful thorns and bunches of two-inch flowers in late spring. Close-up of a Wood’s rose bloom. They’re small, but abundant on the plant’s long canes. The wild Rosa blanda is only about 18 inches tall. Native roses. In New Mexico and other Southwestern states, the Arizona Rosewood (Vauquelina californica), which resembles an evergreen oleander in its foliage and shape, or the Apache Plume (Fallugia paradoxica) both have delicate white flowers that resemble roses. The native plants have adapted to the Southwest and attract bees. This Apache plume (with the Wood’s rose in left background) got too dense and full. They are so easy to care for and forgiving when pruned. Shrubs and groundcovers. Some hybrid roses have been adapted to grow as smaller shrubs and groundcovers. They’ll use less water and take up less space in the landscape. In general, they need less care than other rose types, but have long bloom periods. Flower Carpet Red from Tesselaar is a spreading groundcover rose that reaches no more than 32 inches high. It’s drought tolerant once established and hardy down to zone 5. Image courtesy of Tesselaar. In fact, species, native and certain shrub or groundcover roses are all typically easier to care for and relatively disease free. Just give them mostly sun and prune according to recommendations once in early spring. You don’t have to continuously dead-head blooms, and they have adapted to lower water and the changing conditions of high deserts and mountains, so having them in your garden is more water wise. But there are a few disadvantages. The species roses are wild, which means they can sprout new canes or offshoots. The yellow one in our garden has gotten too thick and large, and will need serious pruning next spring; it’s sort of taken over the area and is shading some other plants too much. Our rosa blanda, red species rose and taller yellow species rose to the right. It blooms earlier than the others, so we have color from early May through September. Another disadvantage is that if you love to cut long rose stems to use the blooms in flower arrangements, you won’t enjoy these varieties as much as hybrid tea roses; their stems are typically shorter. However, if you want to walk or sit next to them in your garden and stop to smell them, or simply enjoy the beauty of the plant and blooms, you can have your roses and save water too! Our rock garden has a few native roses. We decided to try harvesting some rose hips this fall to see what we could do with them. The rose hip is the fruit left behind after a rose has faded, and one of these bushes was perfect for harvesting the fruit. We could tell because several critters had already been around the bush doing the same. Unfortunately, I don’t have a good photo of the bush in bloom, and it was a little unruly when we moved in, having not been pruned the previous year while the place was on the market. I gave it a little haircut, but didn’t want to do too much too late in the season. It will get a deeper prune this year! Here’s a shot of the rose section of the garden. Looking past the weeds, see a new grandiflora a friend gave us (pink blooms) in the foreground and a really prickly native rose to the left. A bushy native rose sits in the middle; it didn’t bloom much, but we think it is pale yellow. Our rose hip plant, which produced pretty pink blooms and tons of fruit, is right of center and back. Rose hips pack a punch of vitamin C, so we didn’t want them to go to waste. We read up on when to harvest (about a week after the first frost) and waited until a nice day. It ended up taking us a few nice days, a few buckets and a step stool. We never got them all, but as you’ll see later, we have more than we could ever use. A bunch of picked hips, well one tiny bunch, not the entire bunch. From what we read, they should be deep red and just starting to wrinkle or dry a bit. They seemed a little soft and resistant to harvesting the first time we tried, so we waited a week or so and tried again. First up, jelly. Because it’s sweet, that’s why. We had to pick through and clean off the hips. We found a recipe online and after some trial and error, managed to get enough good liquid out of our boiled hips. They were so pretty and smelled really good while boiling. Pot of boiled rose hips for making jelly. Maybe it was the altitude, but we had to run ours through the fabric again to get enough good syrup for our jelly. The good news is that the jelly set and we like the taste. We’ve given a few jars away and kept the rest for us. It’s a little tart, but otherwise good. And I love the color. Somehow, I feel less guilty eating buttered toast when I spread the rose hip jelly on it. Rose hip jelly. We put up five jars this fall, keeping the extras in the garage (cool) in a small cardboard box (for darkness). The next attempt was tea. I thought the tea would be a healthy, caffeine-free drink for winter afternoons and evenings. I have not had as much luck with the tea, however. Most recipes say to boil berries for 15 minutes and then crush, steep and strain the contents. Or, you can crush the berries in a food processor and steep them in a tea sock (making sure not to let seeds or hairs from the hips through). But I’ve found that even after steeping for 10 minutes, the tea has little flavor. And after too much time, tea is no longer hot! I’m trying to figure out if I’m doing it wrong (so likely…) or if some of the berries were old, hanging out on the bush since last year. Drying the hips was easy here, where humidity is…what’s humidity? We laid the first batch on an old window screen over a box, but then just spread them out in an old cardboard box. I keep my processed barriers in a small sealed container and some clean berries in a plastic bag. I’ll keep experimenting with the tea, maybe adding more crushed berries next time. We’ve got plenty left to use, so many in fact, that when I needed a quick arrangement around the holidays…why not? 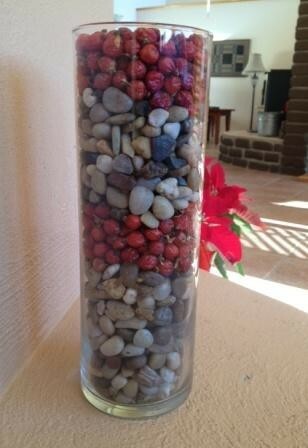 I threw some of the rose hips into a hurricane vase with some decorative rocks, and it’s still out on a small table in our sun room. Rose hip art, at least in the eye of this beholder. Rose hips make a great natural craft item when not providing vitamin C in the form of jelly, tea or syrup. With some good late winter pruning, I hope to improve the yield on both native roses and we’ll see how we do with next year’s crop. In the meantime, I’ll enjoy the flowers, which appear with no supplemental watering.